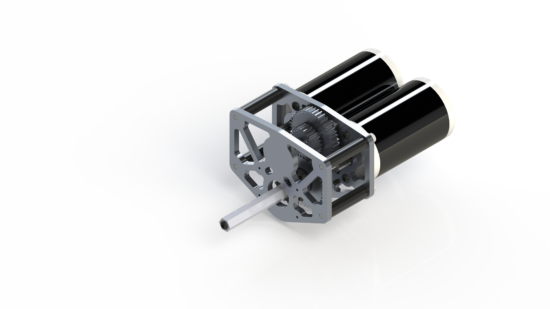 To help save cost, Team Neutrino manufactures custom drive gearboxes. This year’s gearbox is symmetric, meaning that a single gearbox can be used for either side of the drivetrain. This simplifies manufacturing and creating spare parts. To create the plates, we first water jetted them to quickly create the holes and lightening patterns. Critical geometry was post machined on a CNC mill to create good press fits for the bearings and accurate holes. This reduced time for manufacture, as people did not have to manually complete most operations. This gearbox is low profile, a requirement for fitting into our robot and is fairly lightweight. An encoder is integrated into the output shaft, allowing for accurate autonomous performance.